Carnival Corporation, which owns the fleets of the Cunard and Princess Lines, will move the berths of four of its most luxurious ships from the frayed and crowded New York Cruise Terminal to a huge pier being redeveloped in Atlantic Basin, in Red Hook, opposite Governors Island. The shift is expected to advance the city into a new era of passenger ship glory: bringing 250,000 voyagers to town beyond this year’s 900,000; adding dozens of dockings to the schedule; creating thousands of jobs and an array of retail, restaurant, hotel and other traveler-related businesses in Red Hook; and speeding the revival of a once grim industrial-warehouse district. Since the 2006 cruise season, the four ships – Cunard’s Queen Mary 2 and Queen Elizabeth 2 and Princess Line’s Crown Princess and Star Princess – will call about 44 times at Pier 12, a former cargo dock rapidly undergoing transformation, with a rebuilt steel shed, new bollards and fenders, an internal roadway, a 500-car parking area, taxi and bus drop-off areas, and even landscaping. The pier will be big enough to accommodate the 1,132-foot Queen Mary 2, which carries 2,620 passengers, as well as the 963-foot Queen Elizabeth 2 (1,790 passengers), the Crown Princess (3,100 passengers) and Star Princess (2,600 passengers), the last two three football fields in length. Crown Princess, the newest of the line’s ships, is under construction in Italy and will make its debut from Red Hook on a Caribbean cruise next April. 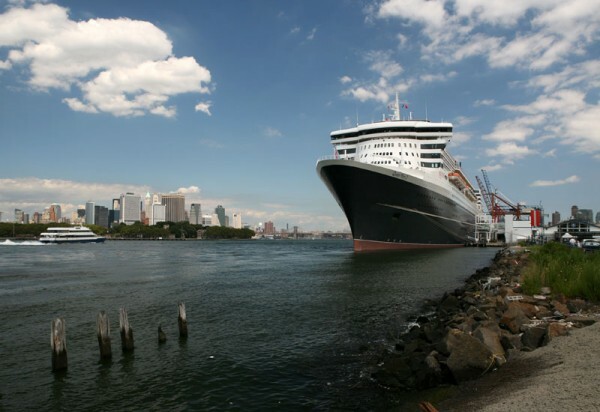 The $800 million Queen Mary 2, the world’s largest passenger ship, made its inaugural voyage to New York last year, docking on the West Side with its stern jutting 132 feet into the Hudson, an incongruity symptomatic of the terminal, which was last renovated 35 years ago. Carnival had decided to shift the berths of some of its best ships to Brooklyn because the Red Hook terminal was the first to be modernized by the city in a $150 million redevelopment project that will include the crowded, antiquated New York Cruise Terminal, between 48th and 52nd Streets. The new 115-room Holiday Inn Express Brooklyn opened in September of 2006.